Smart storage design is key to expanding your options in any living spaces. 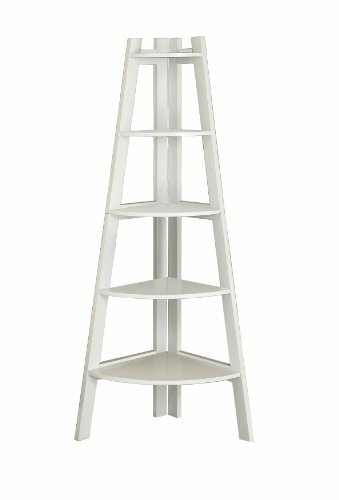 A brilliant mixture of the corner and popular ladder style, this unit sets you up for the ultimate in saving space and organization. Beautiful frame is made of selected solid woods and strength enhancing veneers dressed in a rich finish. Versatile bookshelf comes in two colors option: White and Cherry. Assembly Required. Once assembled, Product Measures 29.5 Inch length by 63.75 Inch height by 21 Inch width. All décor items are not included in this offer unless specified.